It's the second of 2017 and well let's face it, I've already screwed up one of my New Year's Resolution's. One of my resolution's was to eat less chocolate than what I currently do, and although I already have tonnes of chocolate, I went out and bought over 2kg of Galaxy chocolate and I have absolutely no shame! Obviously I don't plan on eating all of this chocolate within a week, or even a month in fact but I guess a chocoholic will always and forever be a chocoholic. I feel quite sad writing this to be honest but today (the first of January as I'm writing this), I took down the Christmas tree's with my mum. It was time for them to go away for another year and holy sugar, the new Christmas tree is heavy to lift above my head but I got there eventually! I actually really enjoy taking down the Christmas tree because it takes at least two thirds of the time it takes to put it up. Despite today's extremely rubbish and typical "UK" weather, my plan is to wake up every morning with a smile on my face and to embrace the positivity of every day and every little thing; or at least try too. I can see clearly what my goals are and I'm ready to smash them. However, waking up at 10:30am on New Years Day did bring a slight downer to the first day of 2017 as it meant a lot of my day had already been and gone while I was still completely soundo in bed until my dog woke me up. However, it was a Sunday so I definitely let that one slide! 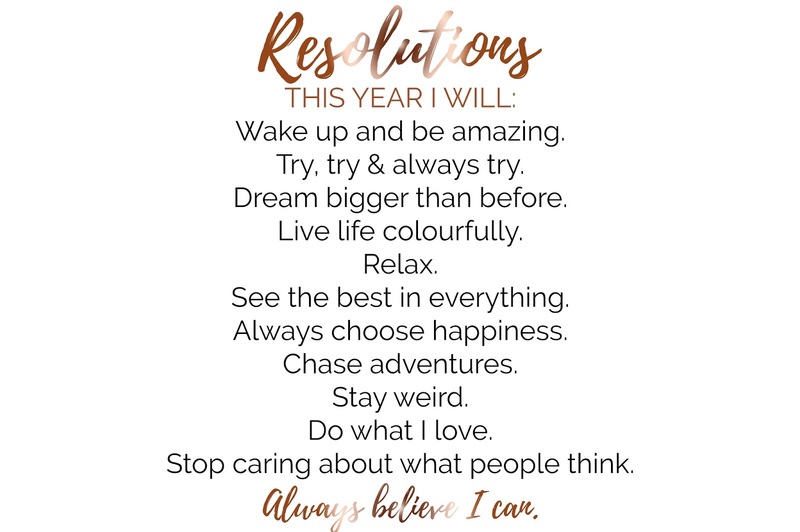 Yesterday I shared my "Happy New Year" post where I share my big New Year's Resolution's which I really want to hit and complete this year! Above is a few of the smaller resolution's which I really want to stick too as well just to have a happier year than previous years. I'm not going to go through all of them because they are simply self explanatory. I want to always choose happiness this year. No matter what the situation is, whether it's big or small I will make the decision which will make me the happiest. I'm so indecisive and I always end up choosing the option which seems the easiest, whether it makes me happy or not and I need to make a change. I need to put my happiness before anything and absolutely everything so I can have a year to remember. One thing which I briefly spoke about in yesterday's post is how I need to stop caring about what other people think. I used to care so much about what other people thought about me that I was doing things I didn't want to do just so people wouldn't judge me. I use to not do something because I didn't want people to comment negatively and why? Why did I care so much about what people thought about me? Because I was bullied for being different but who cares. Who cares if you're different. Embrace being different because you were born an individual and you were born to be unique. So my biggest New Year's Resolution is to not care, to stay weird and to do what I bloody love because it's my life and I'm going to be happy. I would say I dream big. I have so many dreams and one day I hope to achieve all of them but this year I want to dream bigger than ever before. I want to make goals for absolutely everything and I want to hit them with everything I've got. It may be exhausting and it may take a lot of work, but I'm more determined than I have ever been and 2017 is going to be my year. Do you have any smaller resolution's which can make a big different to your year?